Shock collars are useful tools in dog training as well as in correcting undesirable behavior in canines. However, owing to its very nature of delivering some form of electricity to the body of our pets, it is a very controversial gadget. In the hands of a skilled and dedicated canine trainer or handler, an electric dog collar can be an invaluable tool. Unfortunately, this strength somehow diminishes if one doesn’t fully understand the true implications of such a device especially in terms of the correct circumstances where its use can be considered to be the last resort. This is why we’ve talked with experts on the matter to share with you their views on this controversial device and how you, too, can find the confidence to use it judiciously. And we’ll start off with a presentation of the 10 best shock collars we’ve reviewed and tested for your pooch this 2019. It’s inexpensive and provides you exceptional control over your pooch’s obedience and behavior training needs. 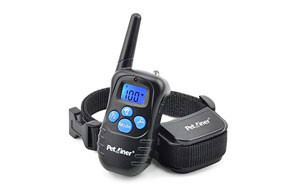 The Petrainer PET998DRB Dog Training Collar is a remarkable piece of equipment that allows you to fine tune the various modes and levels of stimulation that you can deliver to your pet dog. While it comes with a light mode, this has nothing to do with training purposes but rather for increasing the visibility of your hound especially in low light conditions. 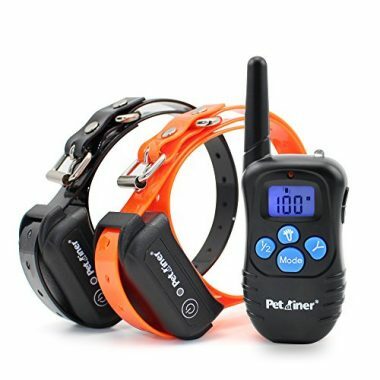 In various online commerce platforms, the PET998DRB is favored by many dog owners and trainers alike because of its excellent combination of affordable pricing, remote controllability, weather- and water- proofing, and ultra-lightweight design. It also comes with a 5-year warranty so it should really be a great deal, although having a lifetime guarantee would have been a lot better. Perhaps that would be asking too much considering it is already priced considerably lower than competition despite the various customization features and power saving technologies that it comes with. iPets entry into our list of the best shock collars for dogs is considered as one of the best-selling when it comes to entry-level units. Unfortunately, we find the price to be somewhat higher than the Petrainer considering they both have the same technical features. 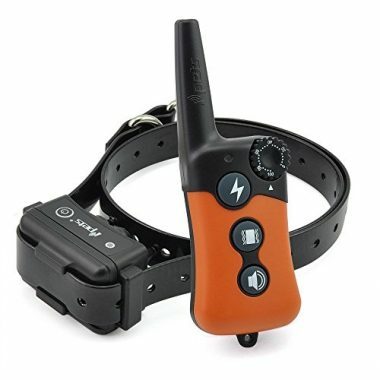 The only difference perhaps is the more unique styling of both the collar and the remote controller of the iPets PET619S. It is programmed with the same customizable stimulation options so you get to determine just the right or correct amounts or levels of correction for your dog’s needs. It even comes with the same 5 year guarantee that allows you to obtain a full refund if you’re not completely satisfied with your purchase or something’s amiss with the electric dog collar that you want it replaced. It doesn’t come with a light mode, however, which is quite a shame since its heftier price tag should mean it has a much better offering. Perhaps it is in the lower weight limit of 10 pounds that it finds its appeal especially among folks with smaller dog breeds. 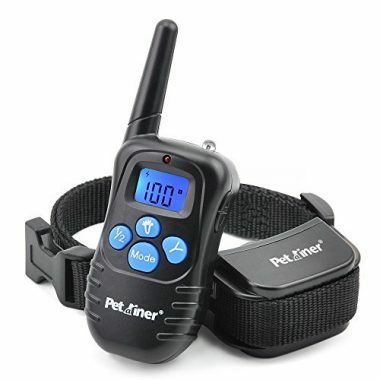 The Petronics dog shock collar with remote is one of two products in this list that is priced slightly above $25 which is, to many, is a great bargain especially if you’re talking about essentially the same features found in similar products. 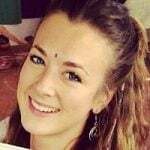 Surprisingly, Petronics enjoys a best-selling reputation in online commerce platforms in the category of head collars. The remote control unit looks like a standard 2-way radio transceiver but is a lot smaller. What is even more remarkable is that the Petronics comes with 4 different training modes, with the vibration and static electricity modes fully capable of 100 customizations for better fine tuning of corrections. It is ideal for dogs at least 10 pounds in weight and can provide for exceptional control even from 330 yards away. 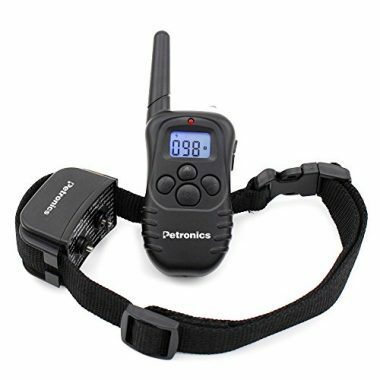 For its price and the addition of a Light mode as a means of training, the Petronics remote shock collar is a viable alternative to more expensive products that don’t even come close to giving what Petronics can offer. Designed specifically for aspiring dog trainers and handlers, the PetTech Remote Controlled Dog Shock Collar comes with an amazing range of 400 yards, although we’ve seen some units that can reach even up to 500 yards. If any, it is its lifetime guarantee that appeals most to a lot of folks. Moreover, it provides exceptional one-on-one expert advice for aspiring dog trainers and newbie pet owners. It is perhaps for these reasons that it costs higher than most of the dog training collars that we have in this list. The PetTech also comes with fully customizable 4 mode training stimulations including 100 different points for either static electricity or vibration modes. PetTech also strongly recommends the use of its static mode only when necessary such as during emergencies. The wireless unit comes with auto power protect to help extend the life of its lithium ion battery. The straps are fully adjustable for more snug fit and the LCD comes in blue backlighting for improved visibility even during the day. If you think the price is rather prohibitive, just think about the lifetime warranty plus the one-on-one support and advice you’ll get to make you a much better dog owner or handler. What’s the difference between the Petrainer PET998DBB and the PET998DRB except for the higher price of the former? Well, the DBB dog obedience collar comes in a more durable and colorful (if you choose the 2-collar system which includes an orange collar) design made of thermoplastic polyurethane or TPU. The DRB remote shock collar, on the other hand, is made of nylon material. It is basically in this difference that you get a substantial bump in the price of the PET998DBB. It still comes with amazing waterproofing, though. And the training modes are still available in 3 types complete with customization options up to 100 levels in either the static or the vibration mode. 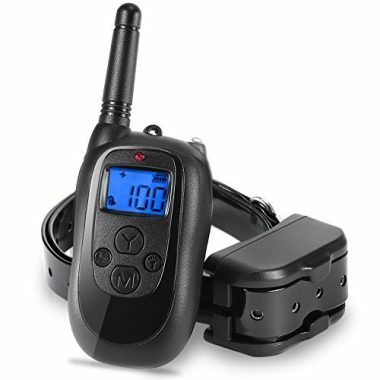 The transmitter is equally protected from overheating and other electrical issues, keeping you and your pooch completely safe while the electric dog collar is in use. So, should you get the 998DBB or the 998DRB instead? Personally, it’s all a matter of personal preference as to the type of material you want for the collar. 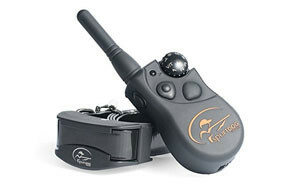 The CarePet dog shock collar with remote is an IPX7 rated device that boasts of wireless coverage for up to 1,000 feet. It features 4 different training modes including 100 levels of stimulation for its static shock and vibration mechanisms. Technically, it already comes with all the specifications that you need to make for an efficient dog obedience training tool in a tough and durable design. The CarePet is priced higher than most, though, so it would be less appealing to the budget-conscious folks. It does come with auto protect feature to help improve the delivery of static electricity in a much safer manner. The battery lasts 10 days, too, but this actually depends on how frequent you zap your pet. At any rate, you can always return the CarePet and ask for a replacement anytime or, if you think it’s really not good enough, then you can request for a full refund. At least, you can try it first. If you’re looking for the best dog training collar which can accomplish all the things that you require from such a device but at a very affordable price, then the ALTMAN Dog Training Collar is a great choice. 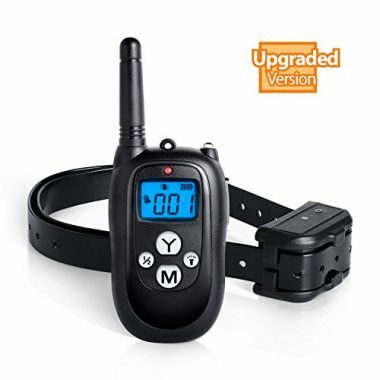 Just a little over $25, this fully waterproof, durable, and extra-tough remote shock collar is perfect for those who are only getting introduced to the joys of canine obedience training. Its range of 500 yards is just one of two dog training collars in this list that has ample coverage that is well beyond the typical 1,000 feet range of other products. In addition to an exceptional wireless range, the ALTMAN also comes with 3 training modes with full customization for better control of your dog. 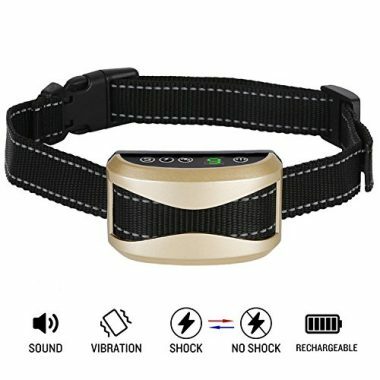 It is this amazing blend of affordability, range, and customizability that ALTMAN deserves its spot in this list of the best dog shock collar with remote. Designed specifically to manage excessive barking by dogs, the Casfuy dog bark collar is an inexpensive yet effective gadget that can help minimize unnecessary barking by your pooch. At the core of its design is a unique Smart Barking Detection processor that specifically senses your dog’s unique bark to be triggered. Unfortunately, such a mechanism will mean it will not put an end to the barking of other dogs. On the bright side, you don’t have to worry about false triggers so that you don’t unnecessarily inconvenience your pet canine. The Casfuy also comes with an auto-shutoff feature which effectively turns the device off if 7 triggers were registered in a minute. One minute of inactivity and the Casfuy powers up again. The battery is also remarkable, able to last from 2 to almost 3 weeks on a single charge that lasts 60 minutes. While it is designed as a dog bark collar, we know that it can also be used for other canine training purposes as it comes with 3 training modes, although the fine adjustment levels are limited to just 7. As a whole, nonetheless, the Casfuy is a great buy considering its safety, versatility, and guarantees. 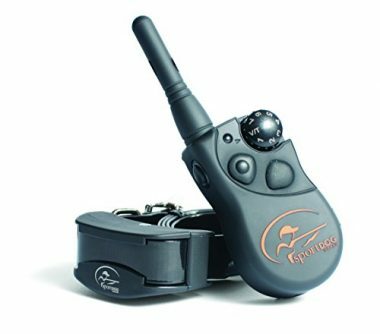 Priced at over $150, the SportDOG Brand FieldTrainer SD-425 Remote Trainer electric dog collar is definitely the most expensive in this lot. A closer evaluation of the SD-425 reveals that it basically comes with almost the same features like most of the products in this list, with the exception of a 500-yard range which it shares with the ALTMAN. 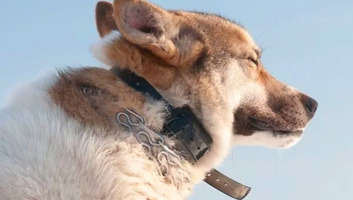 It is fully submersible up to 25 feet, though, making it an exceptional dog obedience collar for those pooches that have outdoor adventurers as human masters. 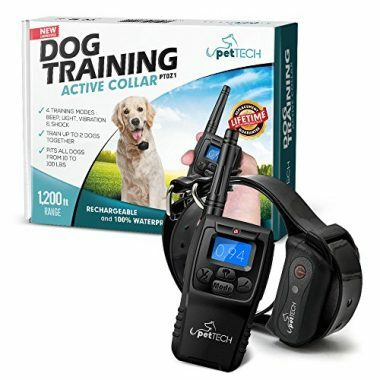 Unlike other systems that only allow for the simultaneous training of up to 2 dogs, the SD-425 transmitter allows for 3 dogs; you’d have to purchase the additional collars, though. Also, you can provide continuous or momentary stimulation to your pooch, a feature that you don’t see anywhere else. Unfortunately, it may have a rechargeable battery, but this only lasts 50 to 70 hours, a far cry from the 20 days of Casfuy or even the 10 days of Casfuy. Technically, it’s a great buy, except that there are other better products at significantly lower price. If you think the Casfuy is beyond your budget for an anti-bark collar, then you might want to get the Bark Solution Bark Dog Collar Training System. 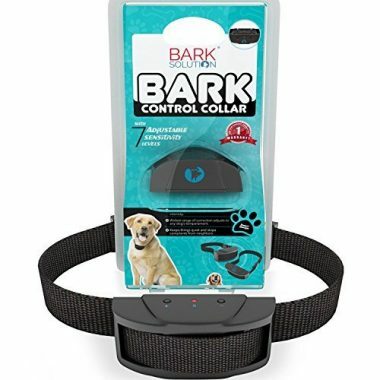 Just a little more than $25, the Bark Solution boasts of the 2nd generation of bark sensors allowing you to fully customize delivery of static electricity that is significantly lower than conventional dog training collars. Do take note that its intended use is for managing your pooch’s incessant barking. This is because it only has about 7 adjustment settings for the delivery of the necessary stimulus. Another fascinating feature about the Bark Solution is that its electrodes are fully replaceable such that if it gets broken you can easily change it. Of course, if you don’t think the product is for you, then you can request for a full refund. Buying a dog shock collar can be quite a headache. There are a lot of things to ask yourself first even before you start picking the best one for your pooch. For many newbies an understanding of what dog shock collars are for is crucial to making a buying decision. Equally important is an understanding of how these gadgets work as well as the different types of electric shock collars available in the market. Only then can you start mulling about the various considerations for buying such a device for you and your pooch. Despite repeated warnings from animal experts as well as animal rights groups against the use of electric dog collars, a lot of people still do actively search for such devices. According to the Humane Society of the United States, shock collars are doggie contraptions that are pretty much similar to a standard collar worn around the neck of a dog and are typically used in dog obedience training and behavior modification therapy for problematic canines such as those with nuisance barking. But why would you want a dog shock collar? Here are some of the more common uses of shock collars. If you don’t want your pet dog to be wandering beyond your property line, a shock collar can be quite useful especially when used together with an invisible or electronic fence system. These gadgets deliver a stimulus to dogs as they get near a pre-designated off-limits zone. You no longer need a physical fence to keep your pet well within your property. There are some devices that deliver a correction every time a dog barks. These are typically embedded with a sensor that allows it to identify the bark of the dog wearing the collar and not any other dog that may be near. If the dog continues to bark, the device delivers more forceful, longer, and even more frequent corrections until the dog stops barking or until a preset time has been reached. As we have already said above, the main use of these devices is in the training and the modification of behavior of dogs through the process of aversive training. It is typically used in off-leash dog training where the pooch is let off the leash to roam around and pay attention to verbal cues or commands issued by its master. It is also used by pet owners in correcting behavioral issues in dogs like aggression towards other dogs and even food aggression. What it does is that it delivers the correction at the right moment to put a halt to the aggressive behavior of the dog. Understand however, that this does not address the reason behind such problem behaviors. It only stops the current behavior at that instant. Many hunters as well as outdoor adventurers use shock collars to train their dogs to avoid dangerous objects and animals. For example, they are taught to avoid rattlesnakes by conditioning them to the sound of a rattlesnake. A caged rattlesnake is often used in such trainings and the dog is shocked quite hard once it gets near the caged rattlesnake. It then associates the shock with the sound of the rattlesnake so that when it is outdoors and it hears a rattle, it will not go to that area where the sound emanates. We’ve been talking about shock or electric collars for dogs. But how do they work exactly? As the name implies, shock collars are devices that deliver an electric stimulus to the body of dogs to startle them and stop them from whatever it is they’re doing. Depending on the type of collar, these devices always have an electronic unit that delivers various kinds of stimulation such as visual, auditory, vibration, and static electricity. When a preset threshold is met, the device is activated. For example, if it is an anti-bark collar, then it delivers the stimulus only when the correct trigger – your dog’s bark – is registered in the device’s sensor. Dog training collars typically combine an electric unit on the collar and a remote control transmitter held and operated by the person. If a given command is not followed by the dog or if it gets distracted from its training by other objects or circumstances, the pet trainer can activate the device using the remote control unit. The device then delivers a preset stimulus to either correct the pooch or to have it refocus on the task at hand. As we have explained in the preceding section, a shock collar doesn’t only deliver static electricity. It can also provide other forms of stimulus such as light, tone, and vibration. The mechanism is still the same, though. The dog performs an undesirable action, the device senses it or you notice it, and a stimulus is applied to correct the behavior or stop your dog from whatever it is doing. The static training mode of these devices should only be used when all other modes have been proven ineffective or are no longer working. There are three fundamental types of shock collars currently available in the market. These are often related to their primary use. As the name implies, these types of shock collars are primarily used in the training and sometimes behavior modification of dogs. These deliver static stimulation to dogs to either correct their actions or to modify their behavior. One of the most crucial aspects of training that training shock collars address is time. Many pet owners understand the need for canine training. Unfortunately, conventional training methods whereby you use a blend of stimulus-response-positive reinforcement looping often take time. Even the most seasoned dog handler can find training a pooch to be especially challenging and will require several weeks up to several months to get the dog to do what it is being trained to do. However, a dog trainer is a professional who devotes most of his time in the training of pooches. Ordinary pet owners simply don’t have the luxury of time. It would already be great if they can spend an hour or so walking or even playing with their dogs. Now, if you include training, then you’re looking at additional time that they have to get from time they should spend for themselves and their families. A dog shock collar can substantially decrease the time needed to see results from pets. And it is these faster results that really appeal to dog owners as well as aspiring handlers. Training shock collars are used in off-leash training and as such have to provide ample coverage for optimum control. Generally, the range is about 1000 feet to 500 yards, although it’s not unusual to see some products further extending the coverage. What this simply means is that you can deliver corrections even from afar as long as it is within the range of the product. As we have already described above, these are dog collars that are often used to control barking. It is natural for canines to bark as it is their way of communicating something. But if you’re already tucked in bed and your pooch suddenly feels the urge to bark, would you rather go out and check what it is your pet is barking at? For most pet owners, shouting at their dogs to shut up is a lot easier than getting up and checking what’s wrong. Unfortunately, we all know that this is not the correct way to address canine barking. As such, when you’re simply glued to your bed, you’d be glad that an anti-bark collar is working to stop your pooch from barking. 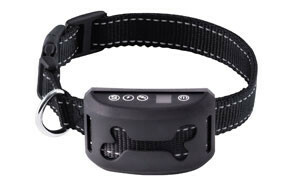 These types of shock collars can actually be considered as a training collar except that the trigger is an invisible fence that constantly sends signals over a pre-determined area. When your pooch goes near this area, the signal sends a message to the receiver on your pet’s collar which effectively triggers the application of the correction. It can be in the form of a beep. If your hound ignores this, then the device vibrates. If your pet still ignores this and decides to keep on going towards the invisible fence, then a static stimulus will be delivered. The thing about these types of systems is that they’re more expensive than other types of electric collars as you are also talking about wires to be placed under the ground. Good thing there are other models that you can choose that don’t require any digging. However, they will still cost you somewhat higher than other systems. Looking at the market for dog shock collars today it is quite easy to get lost from the multitude of models and variants. There will always be products that stand out. One way you can determine the best one for you and your pet is by considering the following things before you even begin narrowing down your options. In addition to the shock mechanism, many products also include 2 to 3 more signaling modes. These can include light, tone, and vibration. The ideal progression is to always start with training modes that are less threatening to your dog. In such cases, you can start with light or tone modes before you apply vibration stimulation. Like shock stimulation, tone and vibration stimulation can be fine-tuned to different levels, further extending the usefulness of the device in training your dog or even in correcting its behavior. It is thus, important to look for products that can provide you with the most number of different types of stimulus so you will not have to instantly resort to the application of static electricity. One of the most important advances in today’s electric collar technology is the integration of processors and sensors that allow the user to dial in or customize the level of intensity of the shock that is delivered. For example, a device can have 100 different levels of increasing intensity using static electricity alone. This can actually go a long way towards training your pooch. Let us say that your dog can typically acclimatize itself to a particular setting every training session that you have. Then this essentially means you have about 100 training sessions before you are going to use the maximum level of static electricity. And if you happen to train 3 times a week, then you’re essentially looking at about 33 weeks of use before you have to apply level 100. Of course, this is just hypothetical. The point is to get a device that allows you to fine-tune the intensity of the stimulus being delivered. As much as possible you would want a device that allows you control of your pet over greater distances. This should give you the chance to try out your pooch’s mastery of the recall. As we have pointed out in the previous section, many dog shock collars typically come with a range of about 1000 feet although there are those that extend this to 500 yards or even further. Technically, it all depends on the location where you’re going to train or ‘control’ your dog. If you’re looking at a hilly terrain, then maybe you’ll even need a device with a mile range. Otherwise, if you are only going to use it in your neighborhood, the usual 330 yards should suffice. You might want to get a shock collar that is fully weatherproofed. This is especially handy if you have a pooch that simply loves the water or even playing in puddles. But, if you’ve got a pet that doesn’t really want to get its feet wet, then you can skip this one altogether. There is a buzz in the canine world saying that really expensive devices can guarantee safer ‘shocks’ for your pooch. Unfortunately, there really is no way we can gauge just how ‘safe’ the shock is since no manufacturer has ever published the actual voltage ratings of their products. That being said, it really doesn’t matter if you get a cheap $25 device or a really expensive $200 unit as long as you can be sure that it allows you the ability to fine-tune the stimulation being applied and possess a greater number of varying stimulation. Here’s the thing: there really is no way to gauge whether the electricity delivered by such devices will hurt our dogs. Unfortunately, there is also no objective evidence that shows it will not. Perhaps ‘hurt’ is not the proper term. Electricity, no matter how miniscule, can lead to tissue inflammation and injury. That is why one of the most common concerns, and one that is duly acknowledged by dog shock collar manufacturers, is the occurrence of electrical burn injuries especially in areas where the electrodes come in contact with the dog’s skin. This typically occurs if the shock collar has been used more frequently than necessary or that it is worn by the dog for an extended period of time. Unlike chemical or thermal burns, electrical burn injuries are quite difficult to diagnose since the tissue injury happens very fast and over a diffuse area. Also, the affected tissues are located much, much deeper. What this means is that your dog may not have any burn marks on the area where the electrodes touch its skin, but the damage may already be forming deeper in the skin and underlying tissues. It is for this reason that many do not actually recommend the use of shock collars. And if you have read a majority of manufacturers’ recommendations, they strongly advise the use of static correction only as a means of last resort. Even companies are saying that other signaling modes be used first before the delivery of shock. While they don’t openly admit it, what these manufacturers are saying is that using the static shock mechanism alone can result to tissue injuries secondary to electrical burns. That is why they strongly recommend using the tone and vibration functions first. And if they do recommend the static correction, it will always be at the lowest setting. Will the electric stimulation from a shock collar hurt your pet canine? Of course! The only problem is that we really cannot gauge just how much ‘hurt’ your pet is getting for every level of static correction it is receiving. Just because it is not whining or crying doesn’t mean that it doesn’t feel anything. As an extension to the above section on whether the electrical stimulation from a shock collar will hurt your dog or not, the obvious answer to the question whether shock collars are safe or not is ‘no’. Shock-only dog collars are never safe for the simple fact that they still deliver electric current to your dog. Also, don’t fall for such words as “humanely” because there really is nothing humane in passing electricity down the body of a dog. However, if you use the tone and / or vibration correction modes of the device, we’d say it is perfectly safe as your dog only gets startled. There are no tissue injuries that occur with vibration and tone modes. The use of dog shock collars for training and canine behavior modification purposes is a deeply emotional one. Even manufacturers indirectly admit that shock correction is not the best way to train dogs; otherwise they would have made their products as shock-only devices. This doesn’t mean that it is not useful, however. There will always be problematic dogs that will never be responsive to traditional training and behavior modification strategies. In such cases, the aversive nature of dog shock collars can very well be the only answer.